The Blue Stars productively wrapped up their March rehearsal camp despite being forced inside by wintry weather. The weekend was scheduled to be one of the group's first ventures outdoors for visual rehearsals. Reported on the corps' Web site, visual staff members took the weather in stride, working with corps members inside on movement and marching techniques. Throughout the weekend, the horn and percussion sections also practiced music that will be part of the corps' 2008 production, "Le Tour." Watch a video update on BlueStars.org. 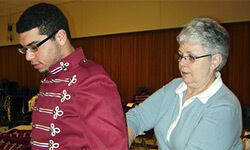 The Cadets wrapped up a weekend rehearsal camp on Sunday, March 9, at a new practice facility in Springfield, Pa. A Web site report says that the corps' creative team has "locked in eight solid minutes" of music for the groups' 2008 production "And the Pursuit of Happiness," which corps members worked on throughout the weekend. 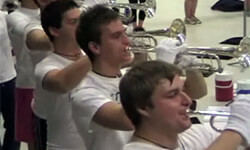 Fans can listen to an audio clip from the camp on the corps' Web site.